where every unhurried step is to be made with the utmost purpose. I became overwhelmed with a sense of kinship as I pondered the many works of art. no matter what the medium. awe-struck as I made my way through the galleries. to fully appreciate the scale of these massive works. 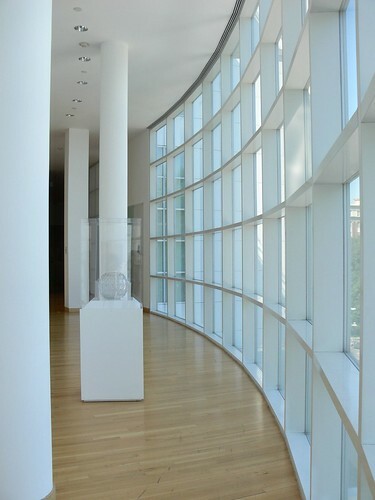 The bright and spacious, Modern and Contemporary Art wing was among my favorite. For hours, we wandered around the many levels housed within the High's walls. in retrospect, that would have been unthinkable. It's better to have 3 or 4 hours. time, and I left with a great sense of gratitude. More visits to galleries are in order! 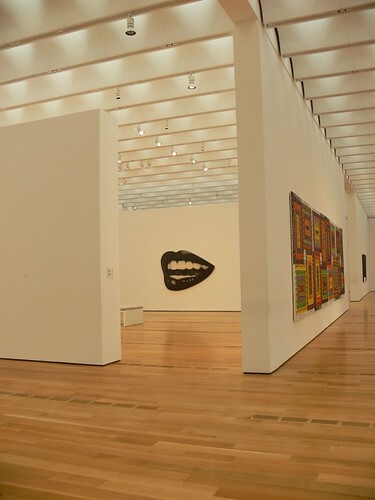 When is the last time you walked through a gallery? I loved your takes on Mondays. Mine wasn't all that bad! What a glorious structure, so pure white inside and outside, thus showcasing the art. I'd love to visit for the building alone (love that shot of the guy walking up the ramp, o wow). My last gallery visit was almost exactly a year ago when we went to Portland (OR) for the wondrous exhibit, "Rembrandt and the Golden Age of Dutch Art." It was phenomenal being in the presence of his actual art and that of his compatriot Dutch painters. 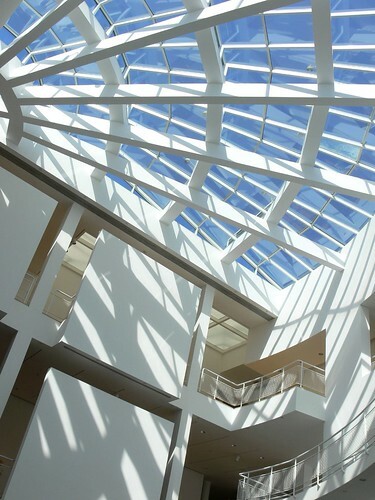 The High Museum is an incredible structure and of course houses many inspiring pieces of art. 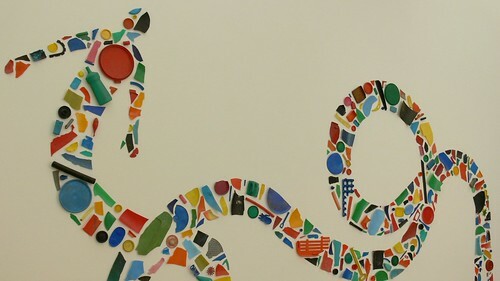 The folk art collection is one of my favorites but I always look forward to the current exhibits too. Last museum I visited was the Georgia Museum in Athens. I saw "The Ring Shows: Then & Now and Putting the Band Back Together". A fascinating exhibit. I cannot remember the last time I went to an art gallery in the flesh. It is hard work doing that when one has children to whom large spaces equate with hurtling around and playing! To be honest though, I feel as though I have visited a gallery each time I visit yours and Technodoll's photoblogs. That looks like a wonderful place! The building is a work of art in itself. That was really a great little field trip. I LOVE galleries. 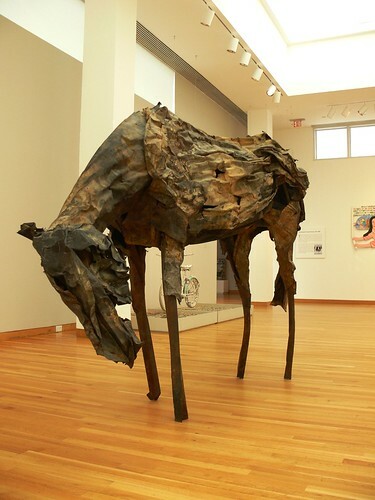 We have a cool one here at Penn State- The Palmer Museum of Art. I'll try to take some pics and post sometime soon. You're inspired me. 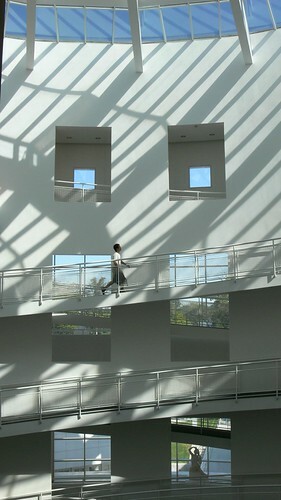 this is a beautiful museum ~ the light~ the windows and of course what lively pictures you highlighted in your photos! I cannot remember the last "real" gallery I have been to, but each day at my job I see "works" of our future hanging in rooms and hallways ~ at the preschool where I teach music and movement art is really featured. I don't remember the last time. Oh wait, the kids and I toured our local liberal arts college gallery probably 6 months ago. We love that every time. My husband surprised me earlier this year with a trip into Corning, NY. We visited the Rockwell Museum of Native American Art. LOVED IT, but the best part was they were hosting an Ansel Adams and Georgia OKeefe exhibit from their trip west many many years ago. While we were there we also visited the Corning Museum of Glass. Loved both!!! I love the light in this museum. These photos are gorgeous too. see, we are all inspiring each other. just yesterday i made plans with A. and the grandsons to go to the war museum. we have an incredible number of museums/galleries here in town since we are the capital city of canada. 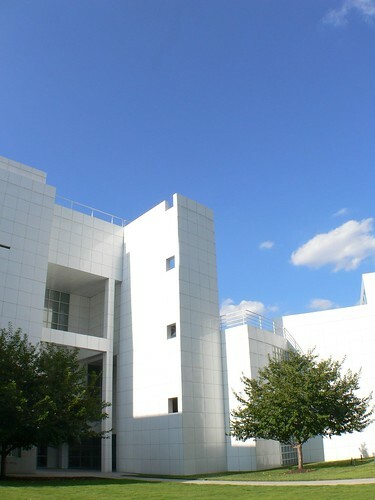 and, i googled the high museum after reading your post. you photos are pretty pretty good. I would have loved to stroll with you through these galleries. This looks like a wonderful museum. Visiting museums is one of my favorite activities so I do it often. I love the shadows created by the building in the first shot. What amazing photos!! wow, beautiful -- the building itself looks like a work of art, and your photos of the architecture are amazing! 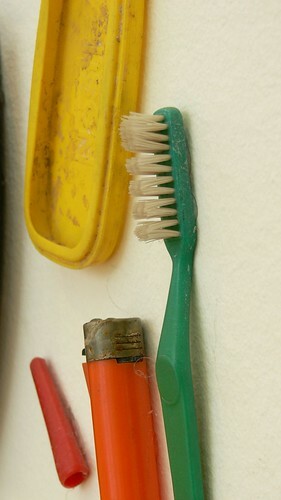 I was with you until I saw the one with the tooth brush. I guess I have art on my bathroom sink counter. I am having trouble logging into your blog a lot these days. Is anyone else having this problem? I'm way overdue for a trip in the museum... waaaay overdue. Loved the inspiration!! That was awesome. I love the first pic. The lines are incredible. Hey, is that you in the bottom of the second pic? Beautiful museum. You got some great shots. Simply breathtaking architectural shots and also a good view of inside the museum. The last time I was in a gallery was in September, a little over a month ago. Looks beautiful! The buildings remind me quite a bit of the Getty Art Center in LA. ps - I try to visit the Houston MFA fairly regularly - will go next week. They had an amazing exhibit this spring by a female Japanese photographer. the building itself is gorgeous - I love the whites! I love the minimalist look of the inertia and the clean lines of the building. I don’t get to a lot of galleries unless there are some hands on exhibits to kid the kids occupied. When they start to get board on an outing, is a recipe for disaster. Years ago I visited this museum and loved it. Thanks for a great review. And there is a photo blog called Hey Harriet that sponsors Shadow Shot Sunday, and your first two photos would be excellent posts for it! Your blog is very beautiful, and thanks for visiting mine also.